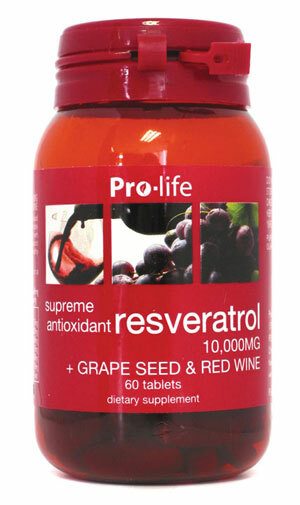 Supreme antioxidant Resveratrol + grape seed & red wine. This product contains tableting aids. Some herbal extracts used. cardiovascular protective effects attributed to resveratrol and to red wine. from different phyla such as yeasts, worms, flies and short-lived fish. mechanisms by which resveratrol may act as an anti-aging agent. mimicked the effects of CR in insulin mediated glucose uptake in muscle. some aspects of CR and retarded some aging parameters. mediator, promotes longevity and is an attractive strategy to fight cancer. potential cancer chemopreventive agent in humans. human pancreatic cancer cell lines, PANC-1 and AsPC-1. deoxyuridine triphosphate nick-end labeling assay. (angiogensis) of HUVEC by resveratrol. activation of c-Jun N-terminal kinase. brain tissue in patients with Alzheimer's disease. transaminase, alanine transaminase and alkaline phosphatase. results are comparable with glyclazide, an oral standard anti-diabetic drug. effective therapeutic agent for the treatment of diabetes mellitus. conditions that range in severity. Epidermophyton floccosum, and Microsporum gypseum. red wine and grapes, exhibits a number of biological activities in human body. the effects of calorie restriction and retard the aspects of aging. healthy cardiovascular and immune system for optimal wellness.